Магазин кристаллов позволяет игрокам покупать различные предметы за особую валюту — кристаллы. Доступ туда осуществляется через панель Торговой компании «Чёрный лев» (по-умолчанию O). Большинство покупаемых вещей немедленно доставляются игроку по игровой почте. Доступные кристаллы отображаются во вкладке с соответствующим значком в верхнем левом углу. Buy Gems (Купить кристаллы): используется для приобретения кристаллов за валюту реального мира. Redeem Code (Использование кодов): используется для реализации кодов на разные суммы кристаллов, приобретённые у сторонних поставщиков. Home (Главная): высвечивает разные «хитовые» вещицы, а также список последних покупок (Recent Purchases). Promotions (Промо-акции): свежие новинки магазина, распродажи и сроки распродаж. Style (Стилизация): такие вещи, как уникальные скины для экипировки и костюмы. Special (Особые вещи): включают различные расходники, наборы красок и собирательские инструменты. Services (Услуги): включают предметы, дающие доступ к различным услугам и модификациям персонажа. Boosts (Усилители): предметы из категории бустеров. Toys (Безделушки): включают миниатюры, музыкальные инструменты и игрушки. Upgrades (Улучшения): включают апгрейды непосредственно для игрового аккаунта игрока и домашнего инстанса, финишеры и средства доставки почты. 800 1 $10€ £8.52 This full set of heavy armor skins can replace the appearance of heavy armor pieces, once per slot. The skins will also be unlocked in your account wardrobe. 800 1 $10€ £8.52 This full set of light armor skins can replace the appearance of light armor pieces, once per slot. The skins will also be unlocked in your account wardrobe. 800 1 $10€ £8.52 This full set of medium armor skins can replace the appearance of medium armor pieces, once per slot. The skins will also be unlocked in your account wardrobe. 300 1 $3.75€ £3.2 This will replace the appearance of any helmet of any weight class and unlock the skin in your account wardrobe. 200 1 $2.5€ £2.13 This will replace the appearance of any helmet of any weight class and unlock the skin in your account wardrobe. 200 1 $2.5€ £2.13 This will replace the appearance of any helm of any weight class and unlock the skin in your account wardrobe. 500 1 $6.25€ £5.33 This will replace the appearance of one helmet armor of any weight class and unlock the skin in your account wardrobe. 150 1 $1.88€ £1.6 This will replace the appearance of any helm of any weight class and unlock the skin in your account wardrobe. 300 1 $3.75€ £3.2 This will replace the appearance of one helmet armor of any weight class and unlock the skin in your account wardrobe. 300 1 $3.75€ £3.2 This will replace the appearance of any helm of any weight class and unlock the skin in your account wardrobe. 400 1 $5€ £4.26 This will replace the appearance of one helmet armor of any weight class and unlock the skin in your account wardrobe. 400 1 $5€ £4.26 Double-click to consume. This helmet skin has no stats of its own and can be applied once to replace the appearance of another helm of any weight class. This skin can be converted to PvP. 500 1 $6.25€ £5.33 Double-click to consume. This helmet skin has no stats of its own and can be applied once to replace the appearance of another helm of any weight class. This skin can be converted to PvP. 400 1 $5€ £4.26 This will replace the appearance of any helm of any weight class and unlock the skin in your account wardrobe. 500 1 $6.25€ £5.33 This will replace the appearance of one glove armor of any weight class and unlock the skin in your account wardrobe. 300 1 $3.75€ £3.2 This will replace the appearance of one boot armor of any weight class and unlock the skin in your account wardrobe. 300 1 $3.75€ £3.2 This will replace the appearance of one glove armor of any weight class and unlock the skin in your account wardrobe. 300 1 $3.75€ £3.2 This will replace the appearance of one shoulder armor of any weight class and unlock the skin in your account wardrobe. 400 1 $5€ £4.26 This will replace the appearance of one shoulder armor of any weight class and unlock the skin in your account wardrobe. 600 1 $7.5€ £6.39 Change the appearance of any existing focus. This will also unlock the skin for your account wardrobe. 500 1 $6.25€ £5.33 Change the appearance of any existing sword. This will also unlock the skin for your account wardrobe. 600 1 $7.5€ £6.39 Change the appearance of any existing pistol. This will also unlock the skin for your account wardrobe. 600 1 $7.5€ £6.39 Change the appearance of any existing sword. This will also unlock the skin for your account wardrobe. 500 1 $6.25€ £5.33 This will replace the appearance of any back item and unlock the skin in your account wardrobe. 350 1 $4.38€ £3.73 This will replace the appearance of any back item and unlock the skin in your account wardrobe. 300 1 $3.75€ £3.2 This will replace the appearance of any back item and unlock the skin in your account wardrobe. 500 1 $6.25€ £5.33 Customize your appearance with this talking Replica Job-o-Tron Backpack. He has found gainful employment on your back. It does not increase your combat effectiveness but does provide moral support. Sometimes. 700 1 $8.75€ £7.46 This full outfit can be toggled to appear over armor on any or all of your characters. Can be used by any race and profession. Does not give any stat bonus. 700 1 $8.75€ £7.46 This full cook's outfit can be toggled to replace the appearance of your current armor. Also includes a frying pan bundle item with five fun, nonlethal costume skills! 700 1 $8.75€ £7.46 This full pirate's outfit can be toggled to replace the appearance of your current armor. 1000 1 $12.5€ £10.65 This full outfit can be toggled to appear over armor on any or all of your characters. 700 1 $8.75€ £7.46 This will replace the appearance of any back item and unlock the backpack skin and the glider in your account wardrobe. 2000 1 $25€ £21.3 Usable by any character, this pack is valued at 2675 gems. 2000 1 $25€ £21.3 Usable by any character, these items will help you blend in with the White Mantle. This pack is valued at 2675 gems. £22.37 This key will unlock one Black Lion Chest. Black Lion Chests can be found randomly on enemies or in hidden places in the world. 300 1 $3.75€ £3.2 This kit is guaranteed to remove upgrades from any sort of armor, weapon or trinket and +50% chance for rare materials of better quality. (25 Charges). 800 1 $10€ £8.52 This basic salvage tool can break down items an unlimited number of times, but each use costs a small fee. It does not recover upgrades from armor or weapons. £4.79 This stone can be used in many Mystic Forge recipes to add a random element to Zommoros' gifts. Head to Lion's Arch to discover the Mystic Forge and its secrets. Slowly revives your character from death. This item cannot be used in PvP or WvW. £6.39 Transmutation Charges allow players to transmute equipment with other skins that have been unlocked on the account without losing the equipment stats. The amount of charges available is shown in the account wallet. £53.25 This tool will remove the upgrades from any item, without destroying either the upgrade or the item. £27.96 Utility Primer (12 h): Any utility item consumed while the primer is active will have the same remaining time as the primer, rounded up to the next hour. Does not stack. 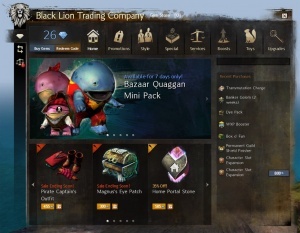 £42.6 Each dye box contains 7 random dyes (5 common and 2 uncommon or rare). Dyes can be unlocked for unlimited uses to color armor on all characters. Dye bottles can also be recycled in the mystic forge. 250 1 $3.13€ £2.66 Double-click to open and choose a nonexclusive dye from the blue spectrum. 250 1 $3.13€ £2.66 Double-click to open and choose a nonexclusive dye from the green color spectrum. 250 1 $3.13€ £2.66 Double-click to open and choose a nonexclusive dye from the red spectrum. 250 1 $3.13€ £2.66 Double-click to open and choose a nonexclusive dye from the yellow spectrum. 1000 1 $12.5€ £10.65 This tool replaces your logging axe on any character. It has unlimited uses and works on all tree nodes. 1000 1 $12.5€ £10.65 This tool replaces your harvesting sickle on any character. It has unlimited uses and works on all plant nodes. 1000 1 $12.5€ £10.65 This tool replaces your mining pick on any character. It has unlimited uses and works on all ore nodes. 1000 1 $12.5€ £10.65 Used to mine all metals. Unlimited uses. Has a small chance to reward a watchwork sprocket on each swing in addition to mining results. Вещи, вышедшие из продажи, можно найти здесь. Бывает так, что купленное не оказывается на почте сразу; зачастую баг устраняется удалением одного-двух старых писем. При входе в интерфейс Торговой компании «Чёрный лев» через NPC-представителя, по-умолчанию открывается торговый пост, вместо магазина кристаллов. Переход к самому магазину осуществляется с помощью соответствующего значка навигационной панели. Цены кристаллов в пересчёте на евро (€) включают 20% налог на добавочную стоимость. Доступ в магазин невозможен с пробных аккаунтов. Эта страница последний раз была отредактирована 28 августа 2015 в 06:19.